So are you one of us? - Most of your clothes are stained, torn and have more holes than cheese. - You quit having haircuts. You'd rather spend that money for food...or beer. - You swapped your vanilla-scented body wash for plain ol' soap. - Your hair is dead and lifeless. You've become like one of the 'before' models in those shampoo commercials. - You once went out of your guesthouse forgetting to comb your hair. Your friend (Lois) had to point it out just as you were opening the door. - You now have only one comb (without handle) to share between you and your friend. - You smell your clothes to check if it's wearable or not. If it doesn't smell like a rat died on it, then it's still ok.
- You wear your clothes twice (sometimes 3x if push comes to shove) to save on laundry fees (or detergent if you're addicted to washing your own clothes like Lois). - The sight of a fresh roll of toilet paper in a public rest room sends you into shivers of happiness. You then discreetly stuff it in your backpack. -You stuff buffet food into your pockets, plastic bags and carry-ons just to have food for the next boat ride. - You don't buy 1 USD bottles of mineral water everyday. Instead, you look for those water refilling stations for 0.30 cents a pop. Or better still, refill for free from your guesthouse (which you chose for exactly that reason). - The guesthouse you stay in complains that they run out of drinking water constantly. You and you friends try and hide the 2 bottles of 2-gallon containers which you just refilled. - You can't remember when you last put make-up on. - Your legs, which were flawlessly perfect before, are now full of gashes, bruises, mosquito bites and scars. - You don't buy drinks at the bar; instead, you and your friends buy them from 7-11 and drink at Tha Pae Gate (Chiang Mai) or sit on the sand near a beach bar so you still have music (Koh Tao). Then, you go to the bars and dance. - Everywhere you go, you pretend you're local just to avoid paying those hefty entrance fees and foreigner's charges. You can't even click here to pay for travel insurance! - You can't remember the last time you ate at a fast-food restaurant. - Actually, you haven't eaten at a place with decent chairs and table cloth in recent memory. 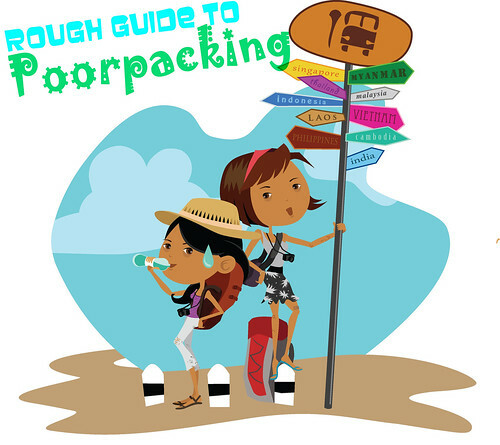 Are you a Glampacker or a Poorpacker? Can't decide? We'll talk more about our transformation "From Glampacker to Poorpacker: The Sole Sisters' Story" on September 10-18th at R.O.X. for the Sole Sisters' Travel Photo Exhibit and Travel Talk. See you there! About the illustrator: Susan was one of 2 Indonesians we'd met and traveled with on the trip. She is a voracious foodie, awesome photographer and uber talented illustrator. When she's not showing off her talents, she's dancing the Americano with us. Yeah, that's exactly why we had to turn into poorpackers! To extend the mileage on our depleting travel fund. It worked! See you on Saturday Angge! Definitely a poorpacker here! But then again, I always stash a make up kit in my backpack. Hihi. You're probably a glampacker disguised as a poorpacker Gaye! ooh! so this is Susan's artworks! love it! CLAP CLAP CLAP to Susan! Another characteristic of us Poorpackers is taking overnight buses to avoid paying a night's accomodations. No make-up? Even better Ding! While we were in Myanmar, we wore no make up, dressed in traditional clothes and loved every moment of it! So true Jody! Can't believe we missed this one! But that was a big consideration, esp in India! Natawa din ako. You're so waisted Grasya!! this is so true!!! hahaha!